Merlin Crossley completed his BSc (Hons) at the University of Melbourne and his doctorate at Oxford University investigating the molecular genetics of haemophilia B. He then moved to post-doctoral position at Harvard Medical School where he investigated gene control in blood cells. In 1995 he returned to Australia and took up a lectureship at the University of Sydney. In 2006 he was awarded a Vice-Chancellor’s Award for Excellence in Higher Degree Student Supervision. He moved to UNSW as Dean of Science at the end of 2009. In February 2016, he was appointed to the role of Deputy Vice-Chancellor (Education). Merlin’s laboratory studies how human genes can be turned on and off by DNA-binding regulatory proteins, termed transcription factors. He investigates the fundamental mechanisms underlying specific gene control, in the context of blood and metabolic disorders. 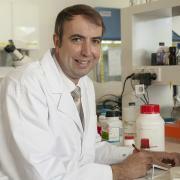 His laboratory acknowledges funding from the Australian Research Council, the National Health and Medical Research Council, the NSW Cancer Council, and the US National Institute of Health.